“Buckle your seatbelt: to delve into Chuck Palahniuk’s writing is to enter an unrelenting circus of pain. There will be blood and bruises, guts and gore. Palahniuk unflinchingly reveals the dark compulsions and actions of characters struggling to find fulfillment in a postmodern world where the Orwellian power of mass media and the crushing weight of the past make doing so all but impossible; Illuminating the opposite of the American Dream.” These are the words of David McCracken. Yes, Palahniuk is one of the world’s most famous transgressive fiction writers, one who has gained the status of an icon with fans and has torn critics apart. Some have even deemed his work as ‘cheap, high school nihilism’. 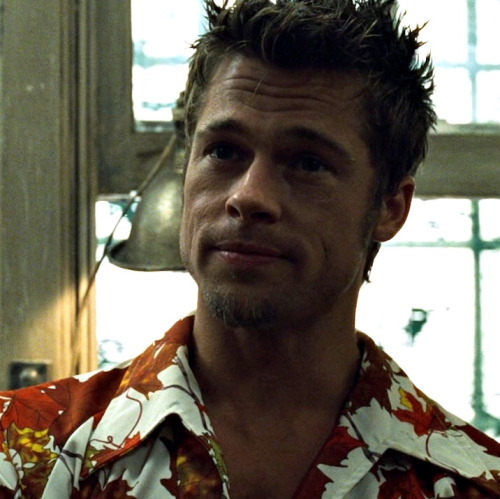 Well, critics may say what they want, but Mr. Palahniuk brought us Fight Club, a now cult classic that changed the way we see the world and consumerism, and our dire need to please people, to be liked by people we loathe – he brought us Tyler Durden. It’s actually kind of ironic that the title says “fictional”. Well, perhaps not so much ironic as completely befitting as he is, in fact, fictitious, a figment of the narrator’s imagination. As the icon of nihilistic literature, Chuck Palahniuk comes to realize upon the release of the graphic novel Fight Club 2 that we, or he for that matter, may not even know who Tyler Durden is. There are many ways to pay homage to this cult classic of a movie that did the book justice, and one of them is by celebrating the unforgettable and unrepeatable style of the equally iconic Sir Durden. Although we definitely shouldn’t be talking (or asking questions), we must take the risk. After all, Project Mayhem may be a topic of conversation that’s off the table, but nobody ever said anything about Durden’s style. The first thing that couldn’t possibly escape us is the plethora of red leather jackets. There were some with wide lapels, others with round collars, those with white patches or the one with yellow and orange stripes. It doesn’t matter whether they’re zipper or button ones, plaid-patterned or not – they’re red. Tough boys wear leather jackets – you know the leather jacket-wearing, motorcycle-riding bad boy stereotype – well, in a way, Durden is that bad boy. The bad boy our narrator never dared to be. However, the question that poses itself is – why red? Why not the regular black? Is it because the blandness of the narrator’s wardrobe had to be contrasted with something outrageous and poignant? Perhaps so, but there could be another explanation. Red is the color of blood, and there is plenty of that during the course of the movie. Red is also passion and bravery – something that the narrator lacks and Tyler is the one to make up for it. He said it himself – he is who the narrator wished he could be, so what do you want when you’re bland? You go over the top. You go for the red jacket, and you wear red aviators even indoors – because you are simply that cool. It’s time to talk about the shirts – we don’t know whether designers looked at Durden or Fear and Loathing in Las Vegas for inspiration, but the Hawaiian and floral shirts with wide lapels and several buttons left undone are a Durden trademark, and now, they’re all over the runways. It’s safe to say that this man, although fictitious, was one ahead of his time. Of course, it takes confidence and abs you could grate cheese on to pull off the colorful and printed tank tops that he sports (under the jacket or without much else), so if you want to dress the Durden way, you first have to get ripped and then snag some workout tank tops - or vice versa. Today is the age of athleisure, but let us remind you that Tyler’s very first outfit consisted of sweatpants with a colorful side stripe, a floral shirt and a red checkered blazer-like leather jacket. Let it be known that Durden rocked athleisure before anyone could have guessed it would become an actual trend with an actual name. This is a guy who wears whatever he wants, just like he does whatever he wants. Although telling you to wear a fur coat over a neon-orange fishnet tank top would be just a tad too much, but you’re well aware that you won’t forgive yourself if you don’t rock the red jacket with an outrageous shirt at least, right? As careless as he is, we know the movie makers aren’t, so if you want Durden’s signature messy hair, you already know that you’re going to have to put some effort in it. Our advice is – pay a visit to your hairstylist, show them a photo and make it happen. Then, arm yourself with hair pomades and waxes, and get up earlier, because that hair isn’t going to just happen by itself right after you get out of the shower. Finally, try to get a hold of as much swagger as you possibly can – and that doesn’t just mean purchasing slouchy military pants and putting on a jacket – you have to own the look. Just don’t get carried away, don’t lose sight of who you are, and most importantly, don’t ever try to pull a Project Mayhem.